The consumption of monosodium glutamate has increased worldwide and has become a major health concern. 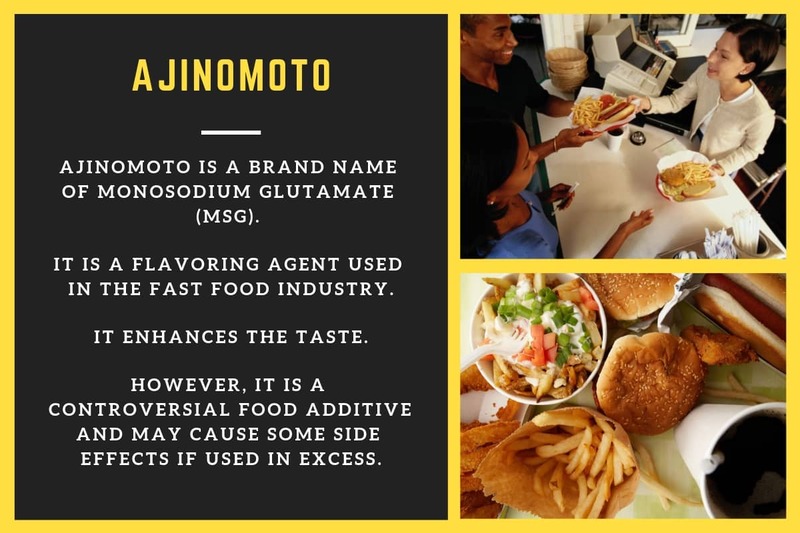 Monosodium glutamate also known as ‘Ajinomoto’ is a famous food ingredient, which is mostly used in Chinese cuisine. There are many controversies about harmful effects of monosodium glutamate, but there is still not enough strong evidence to support the ill effects of consuming monosodium glutamate on health. MSG (monosodium glutamate) is naturally present in various foods such as tomatoes, cheese, mushrooms and potatoes. It is a sodium salt of Glutamic acid. This glutamic acid is an amino acid, which is naturally present in human bodies and food products such as meat, fish, milk and milk products and some vegetables. Tomatoes and mushrooms are usually used in foods for their flavoring properties. Such properties come from the presence of high-level glutamic acid in them. Today MSG (monosodium glutamate) is added to different foods to enhance the overall taste, flavor and color of the food product made. Kikunae Ikeda discovered the flavor enhancing property of MSG in the year 1908. Since many centuries, Japanese cooks used seaweed to enhance the taste of their food. Kikunae Ikeda then isolated ‘L-glutamate’ from seaweed that enhanced the taste and flavor of the food. In the year 1909, MSG first came into the market under the trade name ‘Ajinomoto’. He further suggested that MSG adds ‘UMAMI’, which is a taste in food products besides sweet, sour, bitter and salty. In other words, it provides a meaty, savory or broth-like taste. How is Monosodium Glutamate Made? Today, extracting L-glutamate from seaweed is considered to be a time consuming process. Therefore, new methods have been developed to make MSG. Now MSG is made by fermentation process. This includes fermentation of sugarcane or molasses, starch and sugar beets. However, many other studies have failed to show a relationship between MSG (monosodium glutamate) and Chinese restaurant syndrome. There is no strong evidence to blame MSG for it. Asthma is a common disorder. Two patients with known case of asthma described asthma attacks 12 hours after consuming a meal at Chinese restaurant. Some studies were conducted to observe the effect of MSG containing meal on bronchoconstriction. However, no link was found between MSG intake and asthma attacks and the studies failed to show a clear relationship between the two. More studies need to be conducted to evaluate the effect of MSG on asthma. Foods with added MSG are said to promote weight gain and obesity. Many animal-based studies have found a positive relationship between MSG intake and weight gain. However, human studies are still lacking data. One possible relationship between MSG and weight gain in humans can be increased intake of processed foods. Many processed foods available today contain MSG. As MSG enhances the taste and flavor of these foods individuals may consume such foods in larger amounts. This may further lead to positive energy balance and in turn lead to weight gain. Another mechanism that could promote weight gain is ‘leptin resistance’. Few studies claim that increased consumption of MSG may lead to leptin resistance. Leptin present in the body gives signals to the brain to ‘stop eating’ and it thus controls appetite. In case of leptin resistance, leptin is unable to pass signals to the brain and thus, a person does not know when to stop eating. This may lead to overeating and may again cause positive energy balance. Furthermore, studies need to evaluate the amount of MSG intake that can cause weight gain. Individuals with hypertension need to restricted salt in their daily diet in order to maintain their blood pressure within normal range. Research has showed that sodium chloride contains 40% sodium whereas MSG contains 12% sodium. Many studies failed to show the association between MSG intake and hypertension. Only one study showed the blood pressure raising effect of MSG. This study further observed that MSG intake was linked to increase in the blood pressure especially in women. In addition to this, a stronger association was seen between MSG intake and increase in the blood pressure in individuals who were on anti-hypertensive medications. Sleep-disordered breathing is a sleep related breathing disorder. It is a rising concern and such a sleep disorder may lead to health problems such as hypertension or may also be responsible for road traffic accidents. A research conducted in Chinese subjects showed that those who consumed a MSG (Ajinomoto) containing meal had disturbed sleep pattern and snoring problems. Such individuals were at a higher risk of developing sleep-disordered breathing. In severe cases, it could even increase the risk of death by cardiovascular and pulmonary disease. Furthermore, MSG could also increase the gastrointestinal motility and thus, increase the risk of gastro-esophageal reflux (GERD). This GERD is further associated with obstructive sleep apnea syndrome, which is a part of sleep-disordered breathing. Glutamate serves as a neurotransmitter (brain chemicals that send information throughout the brain and body) in the brain. These neurotransmitters are stored in the nerve endings and are used by the nerve cells. Some evidence has shown that high intake of MSG (Ajinomoto) may have adverse effects on the brain and prolonged intake may lead to damage. The doses of MSG used in the study were quite high and such high amounts are not added to foods. However, the amount of MSG added to food and its effect on brain needs to be determined. Before drawing conclusions, it is important to have strong evidence related to side effects of MSG (Ajinomoto) consumption. However, to be on a safer side, it is better to limit intake of MSG until there is strong evidence, which says MSG is safe or unsafe for human consumption.